Looking for a way to pay homage to some of the best musicians who have ever lived? Check out 10 of the world’s best music monuments and discover lifelike sculptures, captivating museums and more! Freddie Mercury, Lake Geneva, Montreux, Switzerland. 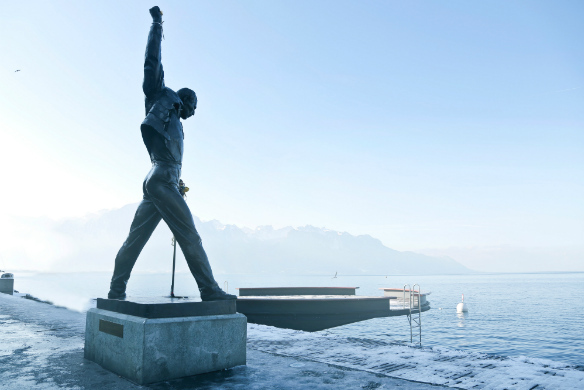 On the banks of Lake Geneva in Montreux, Switzerland, the life of Freddie Mercury, the legendary frontman of British rock band Queen, is commemorated with a detailed three metre tall bronze statue. Replicating one of the best known photographs of Mercury, complete with microphone in hand and his trademark military-style jacket, the striking effigy overlooks breathtaking Lake Geneva, offering spectacular views of the lake and its surrounds. Mercury was a frequent visitor to Montreux in the last decade of his life, making the beauty and serenity of the spot the perfect setting to remember the life and legacy of one of rock’s true icons. Which tracks should you listen to before you visit? Graceland, Memphis, USA. Image Credit: Jamie / CC by 2.0. The sprawling home and estate of ‘the King of Rock and Roll’, Graceland is perhaps one of the greatest monuments to singer and actor Elvis Presley. Opened to the public in mid-1982, the site welcomes hundreds of thousands of fans from across the globe each year, with dozens of themed exhibits exploring the life and achievements of one of rock and roll’s best known figures. Visit Elvis’ trophy room, his racquetball building and the Jungle Room before taking a peek inside his personal airplanes. 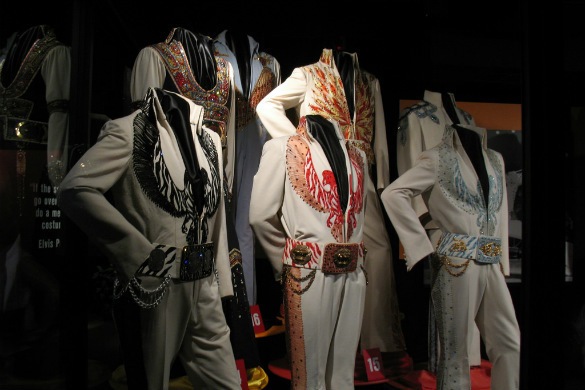 See some of Elvis’ show stopping jumpsuits in the flesh, walk among some of his favourite cars, and be sure to pay your respects at his gravesite. Strawberry Fields, Central Park, New York, USA. Image Credit: brando / CC by 2.0. 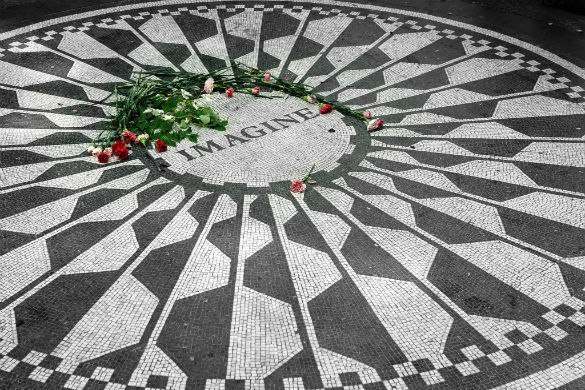 Dedicated to the memory of John Lennon, a singer, songwriter, activist and former member of The Beatles, Strawberry Fields is a tranquil part of New York’s Central Park. 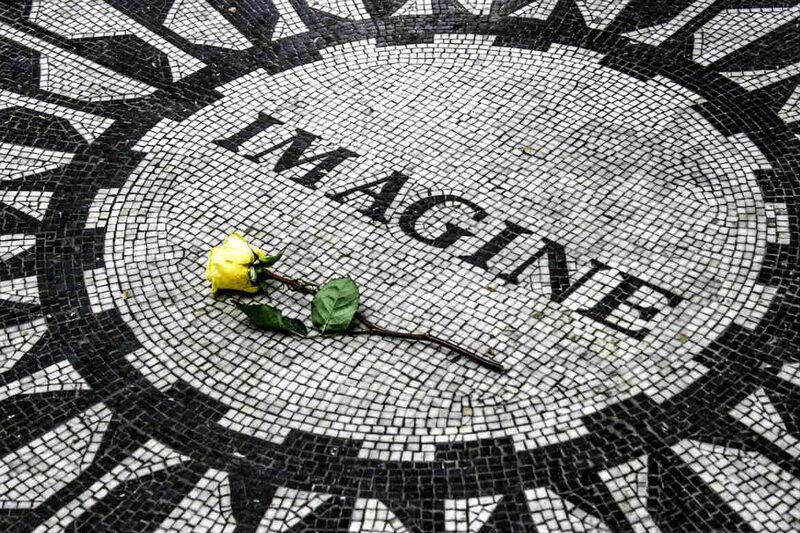 Designed alongside Yoko Ono, Lennon’s widow, the garden features shady trees, beautiful blooms and the iconic ‘Imagine’ memorial mosaic. Located just across the road from The Dakota, the apartment building where Lennon and Ono lived, the garden has become a popular place for fans to gather and remember the influential Liverpudlian on the date of his birth and the anniversary of his death. Jimi Hendrix, Seattle, USA. Image Credit: Peter Collins / CC by SA 2.0. 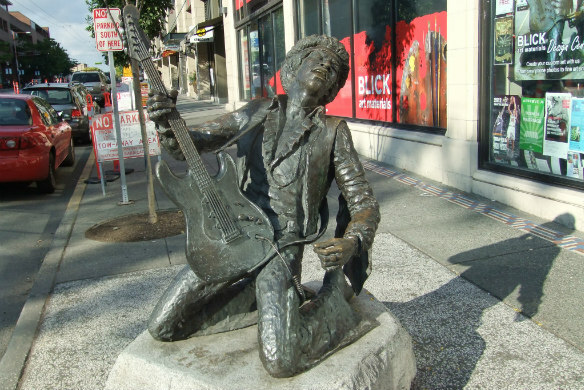 On Broadway Avenue in Seattle, you’ll find guitar genius and hometown rock star Jimi Hendrix immortalised in bronze. Captured on his knees with his eyes closed and a guitar firmly held in one hand, this life-like memorial sees fans often leave flowers and candles at its base. Depending on the time of year, you may also find Hendrix adorned with clothing, scarves, hats or other decorations left behind by fans and locals alike. Be sure to stop by Museum of Pop Culture on 5th Avenue North to learn more about Hendrix’s career and influence in the music world. Arguably one of Liverpool’s greatest cultural exports, there’s certainly no question that The Beatles made an incredible contribution to modern music, with tracks such as ‘Hey Jude’, and ‘Let It Be’ known and loved across the globe. Although there are memorials to the ‘Fab Four’ scattered around the world, the bronze statue located along the Liverpool Waterfront is often considered to be among the best. 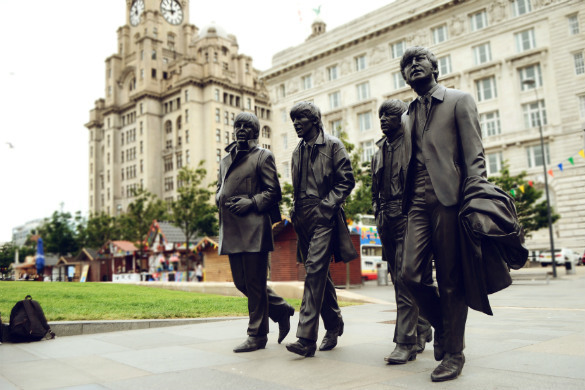 Depicting John Lennon, Paul McCartney, George Harrison and Ringo Starr in a slightly larger-than-life bronze sculpture, the monument was unveiled to coincide with the 50th anniversary of the band’s last concert in Liverpool. Amy Winehouse, Camden, London, England. Image Credit: Neil Crump / CC by 2.0. Introducing a touch of soul and jazz to modern pop music, Amy Winehouse was a significant figure in Britain’s music scene at the turn of the 21st century. Gifting the world with standout tracks such as ‘Back to Black’ and ‘Rehab’, she was widely applauded for her unique vocal talents, and was well known for her trademark sky-high beehive, thick eyeliner and smattering of tattoos. Having battled substance abuse and mental illness throughout her adult life, Amy sadly passed away in 2011. 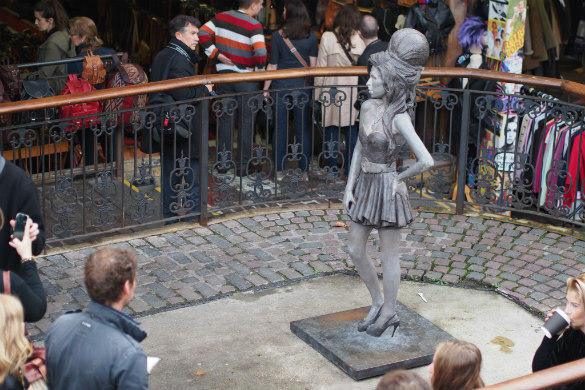 Her life and legacy have since been remembered with a life size statue at the Stables Market in London’s Camden Town that is intended to capture her attitude and strength. Bon Scott, Fremantle, Australia. Image Credit: Greg O’Beirne / CC by SA 3.0. 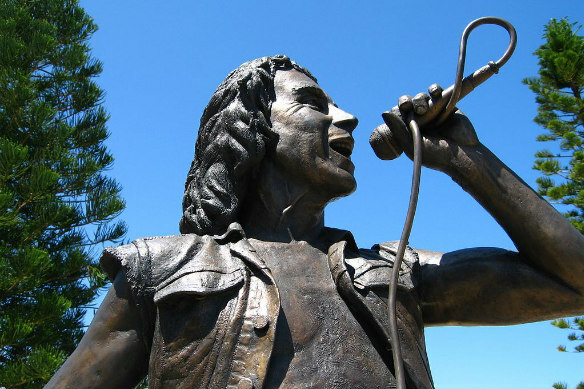 Commemorating the life of a quintessential Aussie rocker, Fremantle’s Bon Scott statue pays tribute to the legendary AC/DC frontman. Having lead the band to their initial international success in the mid to late 1970s, Bon, born Ronald Belford Scott, sadly passed away in 1980. In the years following his death, his grave, located in Fremantle, became a place of pilgrimage for AC/DC and rock music fan, with some considering it to have become the country’s most visited grave. Recognising the importance of Bon to the music community, a bronze statue created in his likeness was unveiled at Fremantle Fishing Boat Harbour in 2008. Beethoven House, Bonn, Germany. Image Credit: Thomas Depenbusch (Depi) / CC by 2.0. 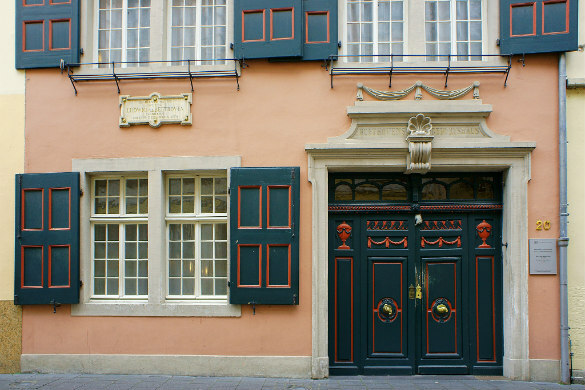 One of the heavyweights of the classical music world, Ludwig van Beethoven’s life and times are remembered with a memorial and museum located within his former family home, Bonngasse 20. The site of his birth, the museum is comprised of twelve different rooms that showcase instruments, manuscripts, letters and other everyday objects that once belonged to the musical maestro. Featuring the largest Beethoven collection in the world, a visit to the Beethoven House in Bonn is a fantastic opportunity to learn more about the man and his ever enduring compositions. Hitsville USA, Detroit, USA. Image Credit: Dig Downtown Detroit / CC by 2.0. Cutting an impressive figure in America’s musical landscape for more than forty years, Motown, founded in 1959, was a record company that fostered the careers of incredible artists such as the Supremes, the Jackson 5 and the Four Tops. 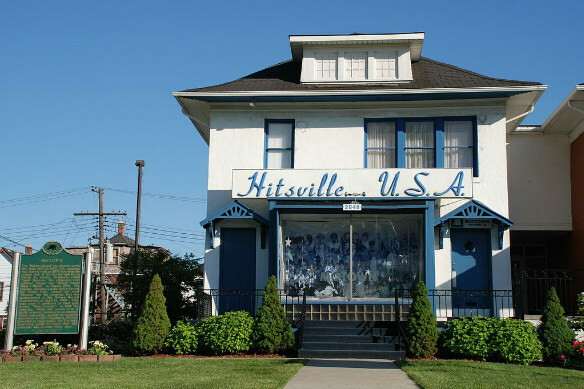 Today, the glory days of the label are remembered at the Motown Museum, housed in the iconic Hitsville U.S.A. building. Filled with memorabilia, photographs and other items that tell the story of Motown, it is a monument to the vision and success of the record label, which shared the talent of its primarily black roster of artists with the world at a time when racial prejudice was rife. Johann Strauss monument, Vienna, Austria. Image Credit: Kiefer / CC by SA 2.0. 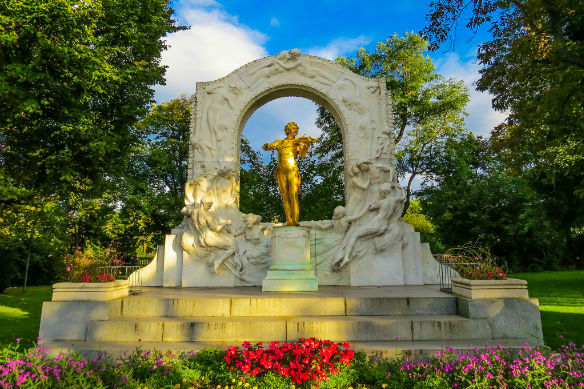 Considered to be one of Vienna’s most photographed statues, the Johann Strauss monument in Stadtpark (City Park) is a beautiful work of art in its own right. Set against a marble relief, a gilded bronze model of Johann Strauss, the famed Austrian composer, stands with a violin in hand. Unveiled in 1921, the popularity of the monument has grown overtime, becoming one of the city’s must-see attractions. Home to the largest number of sculptures in the city, throughout the park you’ll also find monuments to Franz Schubert, Franz Lehár and several other notable Austrian citizens. Ready to visit these incredible music monuments? Find hotels, flights and more with Webjet today!